Self evaluation can work wonders for an employee. It can help him to get in touch with his strengths and weaknesses, thereby helping him to formulate an idea that will help him ace his performances. This could be one of the main reasons why most organizations make use of employee self evaluation forms. Designed by experts, these Evaluation Forms comprise of a number of important parameters that help the employee to gauge himself in an efficient and effective manner. 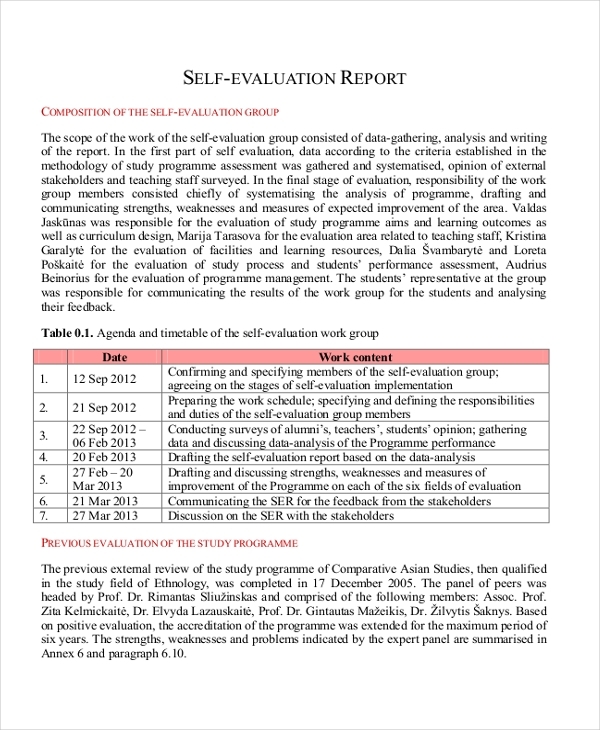 This is a sample of a self evaluation report and can be used by business organizations that expect their employees to submit a detailed report of their self assessment exercise. The form gives the employee an idea of the format to be followed when making the report. 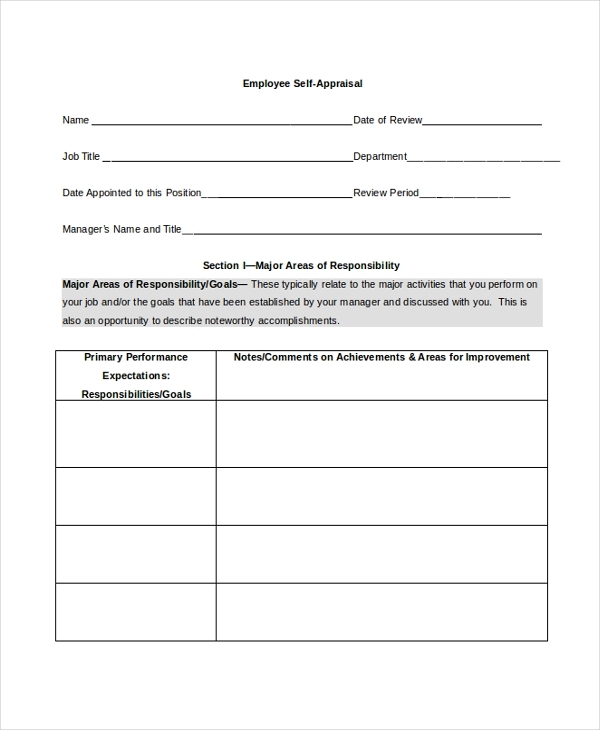 This form can be used by organizations to allow their employees to conduct a self evaluation. This form comprises of a number of questions that analyze the various parameters of an employee skills and abilities. The person should answer these questions to complete the evaluation process. You may also see Presentation Evaluation Forms. As the name indicates, this form is used by an organization to help its employees to gauge their performance during a given period of time. This evaluation helps the employee to understand the areas where might be lagging, thereby helping him to come up with an action plan. 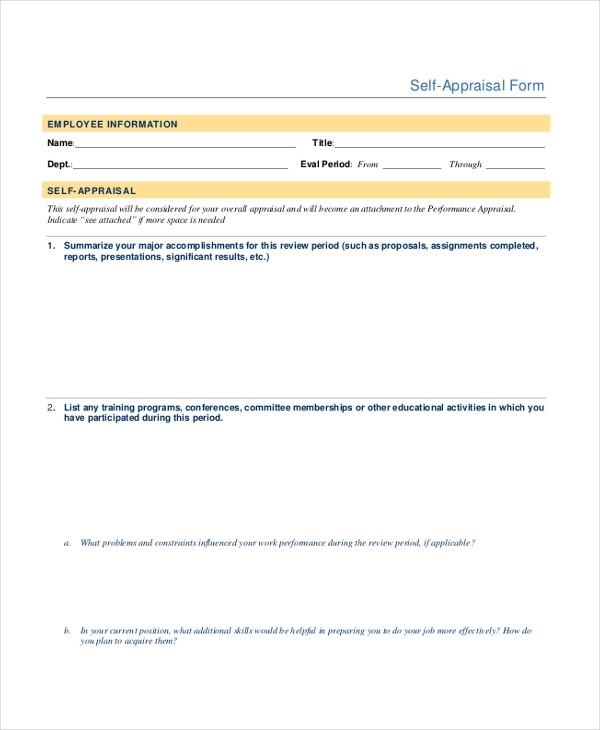 This is an example of a self performance evaluation form and can be used by any organization irrespective of the nature of their business. This employee evaluation form comprises of all the essential parameters against which the employee’s performance should be assessed. You can also see Student Evaluation Forms. A person who wishes to conduct a self evaluation can use this form for the purpose. The form gives him a clear idea of the parameters to be considered when conducting such an appraisal. He can however make changes to this as per his requirements. 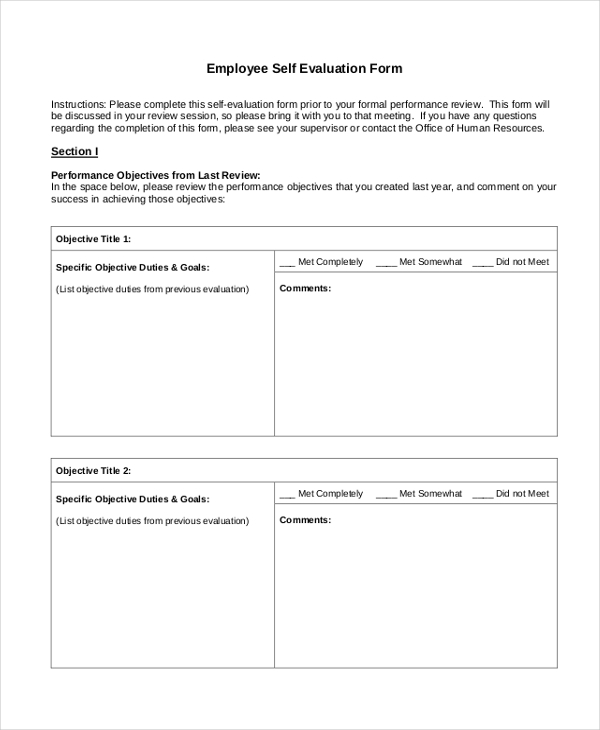 As the name indicates, this employee self evaluation form is available in a PDF format and is compatible with all devices. The form comprises of all the essential segments that would make for an efficient self evaluation form. 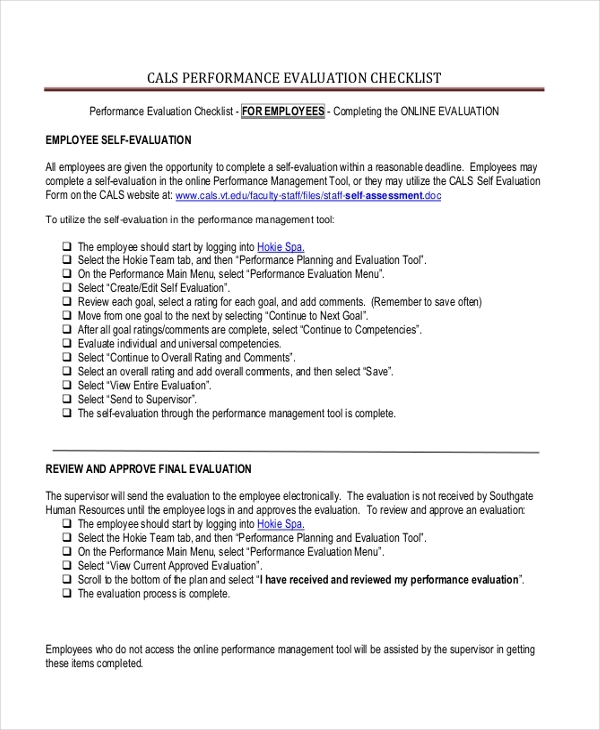 You may also see Performance Evaluation Forms. 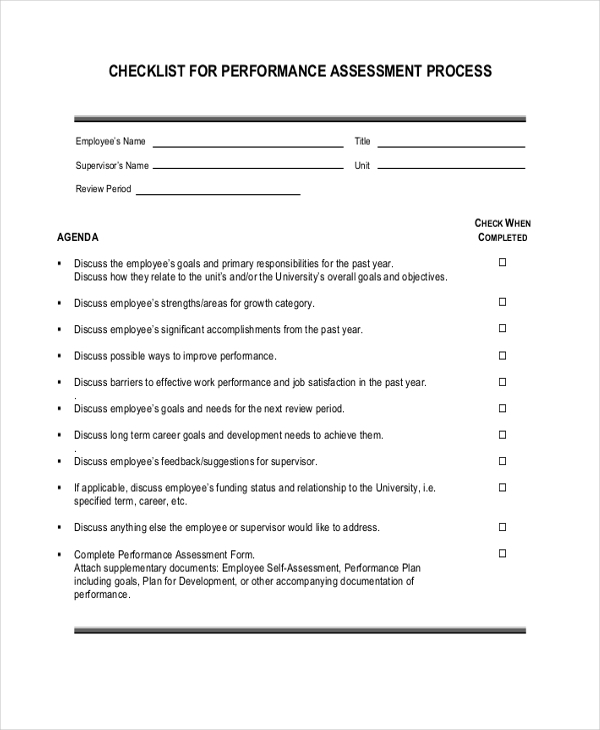 This performance evaluation form can be used by organizations to allow their employees to take an account of their accomplishments over a given period of time and to gauge their performances. This form can help the employee and the organization to formulate an action plan to enhance his performance. As the name indicates, this form comprises of a checklist against which the employee should gauge himself to analyze his performance. This checklist can be altered based on the goals of the organization. You can also see Self Evaluation Forms. 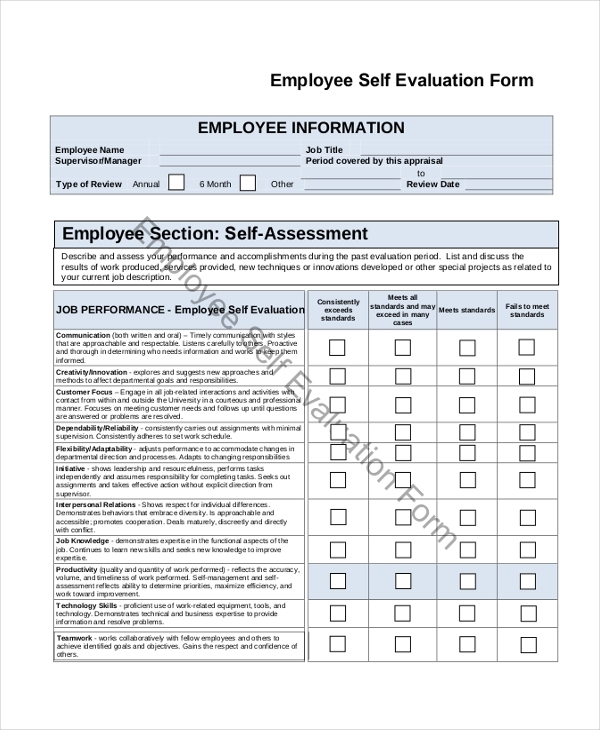 What are the Benefits of Using Employee Self Evaluation Forms? 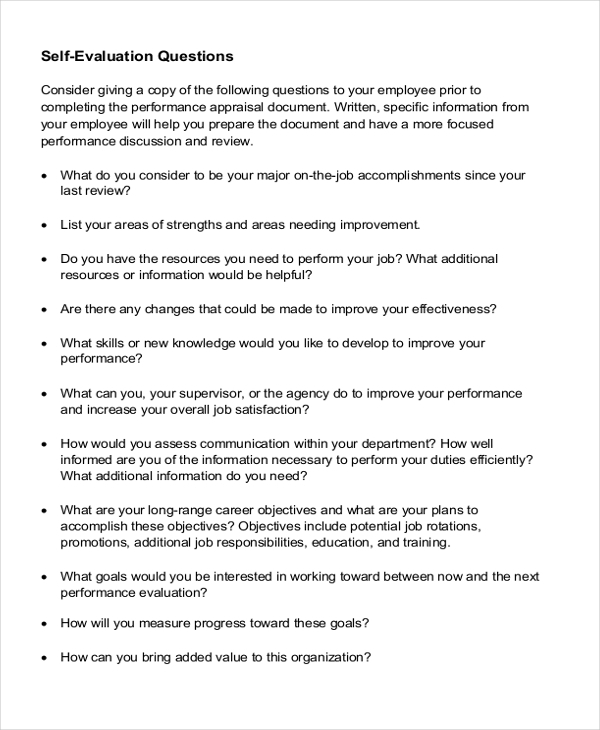 Not sure how to design an employee self evaluation form? Fret not. Just go ahead and check out our collection of these forms. With a wide range on offer, you are sure to find the one that would be apt for you. Download this and then customize it as per your needs. With these forms you can create a unique self evaluation form in a jiffy, that too without any expert help. You may also see Teacher Evaluation Forms.